The worst thing about Ape Out is that it isn’t called ‘Killer Gorilla’. That open goal was right there, tall as King Kong, and yet Ape Out still managed to hoof its title into the stands. I would also have accepted ‘Ape Escape’ as an alterative, although in fairness I think that may already have been taken. As you can probably tell, I’m struggling to find fault with Gabe Cuzzillo’s top-down simian splat-‘em-up. I sat down with it early yesterday, blinked, and suddenly it was mid-afternoon and my brain was fizzing from the effortlessly stylish Ape-based destruction I had just witnessed. It’s arguably the best action game I have played this year so far, and contains some of the best use of a dynamic soundtrack I’ve heard in ages. The most immediate point of comparison here is Hotline Miami, which was a similarly stylised blend of town-down, 2D action with a heavy emphasis on challenge. 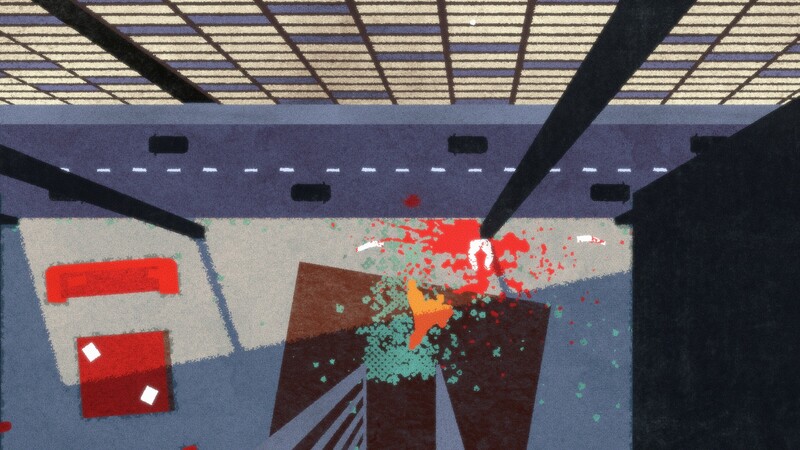 But Ape Out differs from its main inspiration in some fundamental ways, while also happening to be a better game. The primary difference is (obviously) that you play a giant orange ape, with the shape of a gorilla but the colour of an orangutan. There’s isn’t much in the way of scene-setting. Your Gorillutan starts out caged in what appears to be some kind of research facility, before smashing through the bars and engaging in a left-to-right rampage as she attempts to escape. Standing between you and freedom is a small army of gun-toting humans. Your ape can survive precisely three hits before crumpling to the ground, forcing you to restart the level. Hence you need to use a combination of speed, evasion and your massive ape fists to stop your enemies sending you to the great jungle in the sky. 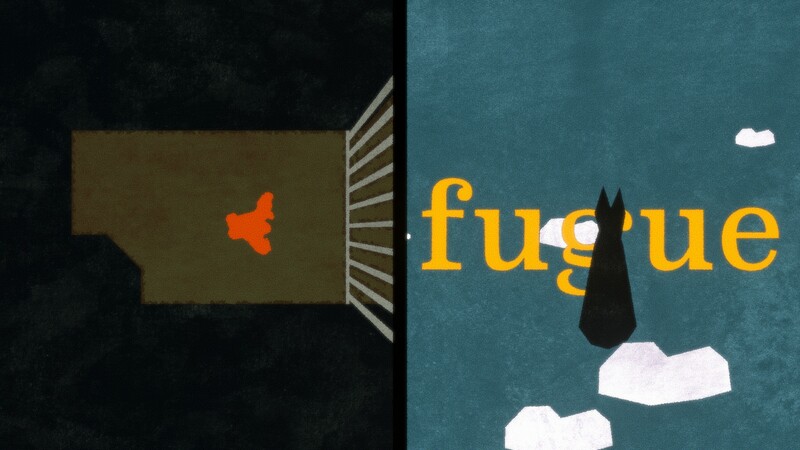 The basic mechanics of Ape Out are extremely simple, but they enable a surprising amount of nuance in play. Your two Ape abilities are shoving and grabbing. 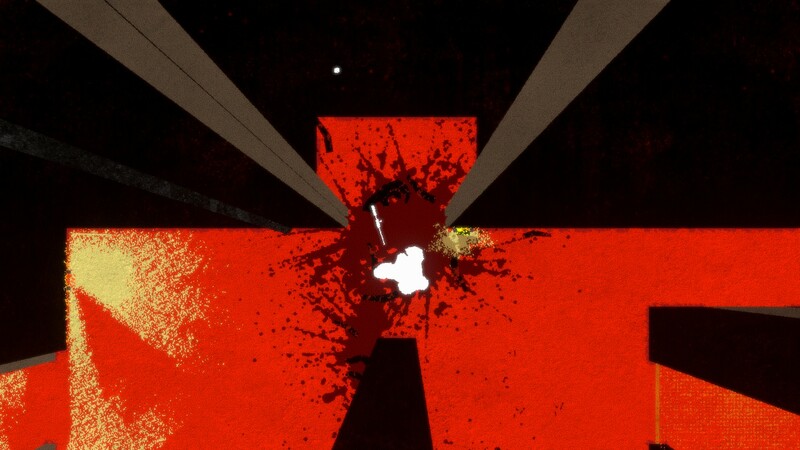 Push an opponent into a wall or another enemy and they will explode in a splash of vibrant red. Press the right-mouse button, and your ape will instead grapple any enemy in close proximity. It’s in the grapple where Ape Out’s complexity emerges. Any grappled enemy becomes a human shield, preventing you from being shot from the front so long as they are alive. What’s more, they will discharge their weapon moments after being grabbed, letting you effectively wield their firearms for one shot (or more depending on the weapon your opponent wields). You can also throw grappled enemies into walls to kill them instantly, or into other enemies to stun or kill them. Unlike Hotline Miami, Ape Out isn’t a game of pure reflex-reaction, although you certainly need to move and think quickly to stand any chance of survival. Instead, it’s more about using your enemy’s weapons and equipment against them. Some enemies, for example, wear bulletproof vests. This makes them resistant to being accidentally shot by their comrades but also means you can use them to shield yourself from gunfire. Other enemies are inexplicably wrapped in explosives, enabling you to use them as human grenades. From a raw mechanical perspective, Ape Out is smartly constructed. It’s not the longest game in the world, amounting to about four or five hours, but it is beautifully paced across that length, evolving and escalating beautifully across its four different stages. The second stage sees you navigating your way down a tower block as soldiers wielding machine guns rappel in through the windows. The third involves escaping from some sort of military complex, ramping up the challenge as enemies cluster together in larger groups. Environments are fixed but enemies spawn randomly, meaning you never quite know what you’ll be facing each time you respawn. During its most intense moments, you’ll be punting, grabbing, and throwing a half-dozen enemies in a matter of seconds, a hairy orange whirlwind of destruction. 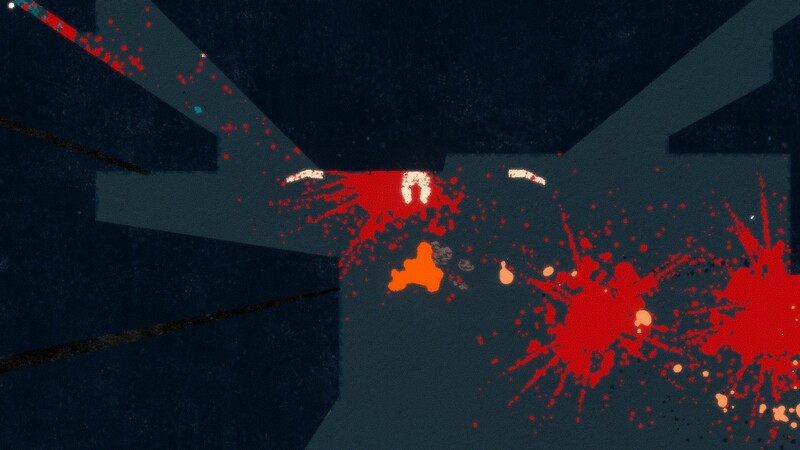 Where Ape Out goes to the next level, however, is in its presentation. 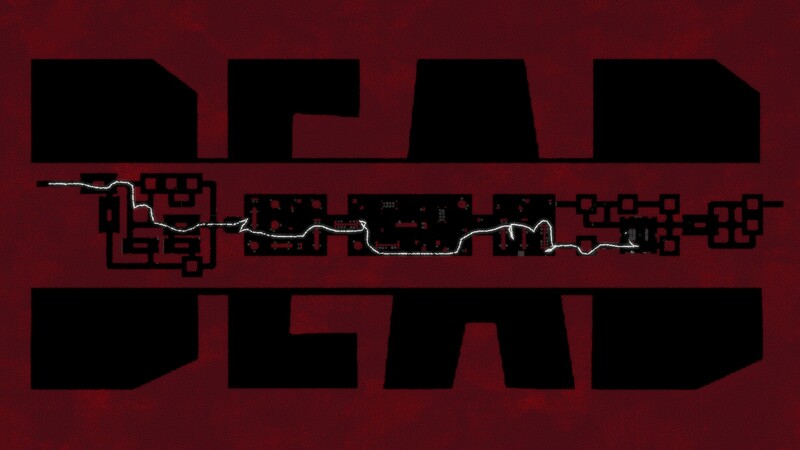 The whole game is layered with this grungy, lo-fi aesthetic, as if designed exclusively to be played on arcade machines in the world’s seediest dive-bars. As your ape lumbers around, textures flicker as if they’re being sketched while you play, while the entire colour scheme suddenly changes mid-level as an alarm goes off or the lights go out. 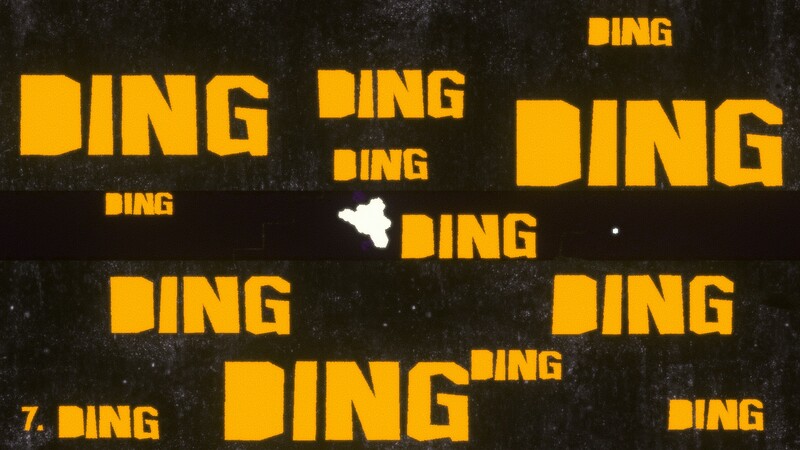 Each level has its own grindhouse-esque title card, usually complete with a perfectly presented pun that encapsulates the game’s tongue-in-cheek style. While the visuals are wickedly stylish, the master stroke of Ape Out’s design can be found in the audio. The soundtrack is entirely composed of dynamic jazz percussion that is seamlessly tied to your actions in the game. Every splattered enemy triggers a clatter of cymbals and an intensifying of the beat. If you grapple an enemy, the rhythm fades as you move slowly forward, the ape’s breathing becoming audible above the soundtrack. 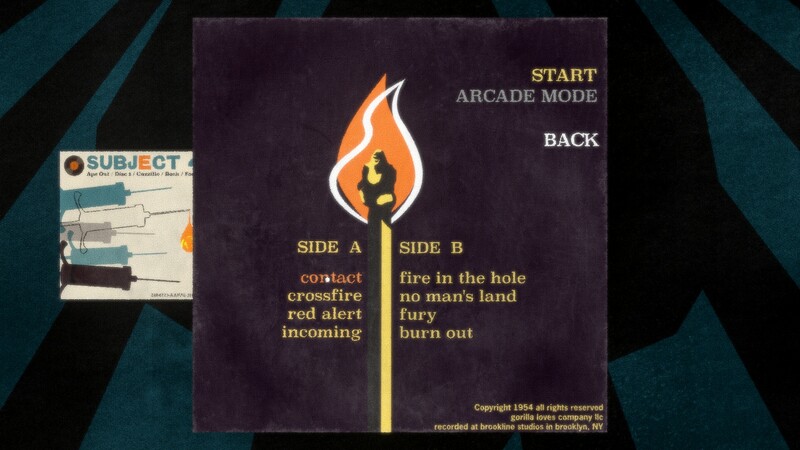 I heard about the jazz soundtrack before I played Ape Out, and I couldn’t understand how it was going to work. Now I’ve played it, it’s such a natural accompaniment I can’t believe nobody’s done it before. Of course improvisational jazz works perfectly with the unpredictable rhythm of a game. Cuzzilllo must feel like the first person who combined cocoa with sugar. How did we ever live without this? I know I said I was struggling for criticisms, but that was 800 words ago and I’ve had time to think since the second paragraph. The game mostly feels great, but the keyboard and mouse controls could be slicker. There’s a slight inertia between moving the mouse and your mammalian tank turning in that direction, which has resulted in me slightly missing an attack on more than one occasion. In any other game this would be a minor thing, but slight misses can easily result in death here, so it’s considerably more of a problem. Also, I think the later levels are slightly too long, and enemy groups are slightly too large, as I found I kept dying in exactly the same places on certain levels. Apart from that…erm…I wish there were more a few more instruments in the soundtrack? Orange isn’t my favourite colour? There’s a surprising lack of bananas? Nope, I’m out. This is a cracking little game, frenetic, relentless, stylish on the surface and smart underneath. From one large, hairy primate to another, Ape Out gets a big thumbs-up.